Primedice’s stats and fame can easily fool you. The question to ask here is, does more active really mean better? I’m here to tell you a flat out no. There’s many reasons why and I will explain. The most obvious is extremely slow rolls. Compared to similar dice sites, the server lag makes the site overall sluggish. 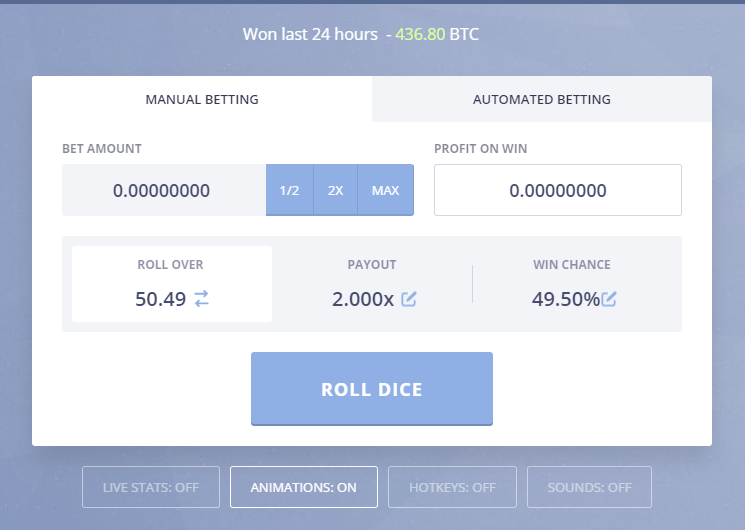 With so many bets a second, the servers can’t handle so many users so there’s nothing to do but slow rolls down. This includes the autobet, the chat, and all other pages and tabs. Update (April 2017): They seem to have fixed the lag issues. Second off, this means slow support. Support is probably one of the worst I’ve seen on the Internet. It’s ridiculous. For North American players, the administrators are the only support members, and both of them are Australian. This means you’re going to have to wait until the next day no matter what. But what’s worse is that it could take several days before you even get the first reply back. With so many emails, 2 members can’t handle all of it, and they refuse to hire support members. To continue on the list, many problems occur. Withdrawals are always running into problems, and this combined with bad support, means a bad experience. The chat is ruined with beggars due to a tip system implemented. On the brighter side, PD offers some things that aren’t available on other sites. The faucet is advanced, increasing the amount you receive the more you are active. The stats section is detailed, and can be helpful at times. The theme is changeable, which in reality does nothing more than change the background picture. There’s a decent affiliate program, 2FA support, and a pleasing design. The first week of November 2014 made a huge impact on Primedice. A single user, known as Hufflepuff, found an exploit that allowed him to rob over 2,000 BTC from Primedice in the time span of just a week. This resulted in the maximum win halving down to 20 BTC from 40. Just months earlier than this, the maximum win was very close to be risen to 80 BTC. For most, this isn’t a problem, but the lowering drove away many high rollers and older players. Primedice is well-established and trusted. Its provably fair system provides everything needed to prove that all rolls were fair. Primedice is considered to be one of the most trusted active casinos. Primedice, fair or not, is always a fun place to be. You can watch the crazy high rollers, try yourself with the faucet, or talk on the chat. Personally, I’ve seeing Primedice rolling down the other side of the hill. Support is terribly poor, rolls are infuriatingly slow, and even the chat is filled with beggars and such. I play at Primedice a lot, and because of the reasons above I simply choose other sites that don’t have the same problems. Primedice was once the coolest place to be, but the increase of activity and the focus on the faucet has taken it down the wrong road. “The Road Not Taken” really takes its purpose when it comes to choosing to play at Primedice or not. Rolls are slow. Rolls are slow. Rolls are very slow. Even with a blazing edge top-notch computer, the site will always be slow. Not just with rolls, but with support and the site all around. Users have had to resort to using external auto-betting bots to compete with the speed of other sites. Financials are reasonable, and the same goes for the questionable-for-some trustworthiness. The site was once the place to be, but with the interest of other casino owners to attempt to overtake Primedice, the switch from PD to a different site might not be a bad choice anymore. I previously reported that the site’s rolls are slow. While that was true when this review was published in 2015, it’s no longer the case today. In fact, Primedice is one of the fastest dice sites on the web today and performs incredibly well considering the enormous amount of traffic it handles. Additionally, Primedice has addressed concerns about slow support, and has rolled-out a 24/7 livechat support team. The support staff exclusively work on PD and have been trained for PD only — an awesome step in the right direction. All in all, Primedice claims their support team has increased in size 5x. PrimeDice does not currently offer any Bitcoin bonuses to its players!